Microsoft's business segment that includes Windows licensing, Xbox, Surface PCs and phones reported revenues down sequentially and year-over-year, hurt in particular by the ongoing collapse of Windows Phone. Surface revenues increased 9 percent over the year-ago fiscal Q4 ($965 million vs. $888 million), but are down sequentially from the $1.1 billion revenues Microsoft reported in April and down dramatically from peak sales of $1.35 billion it reported in January. Despite a rosy forecast by IDC claiming that Surface would soon outpace Apple's iPad sales, it appears that Surface is instead stuck in a cycle of quarterly sales that rarely punches past 1 million units. Apple is set to report its tablet and Mac sales next week, but even after big declines from its peak iPad sales reached in 2014, the company has been selling around ten times as many tablets as Microsoft each quarter over the last year. 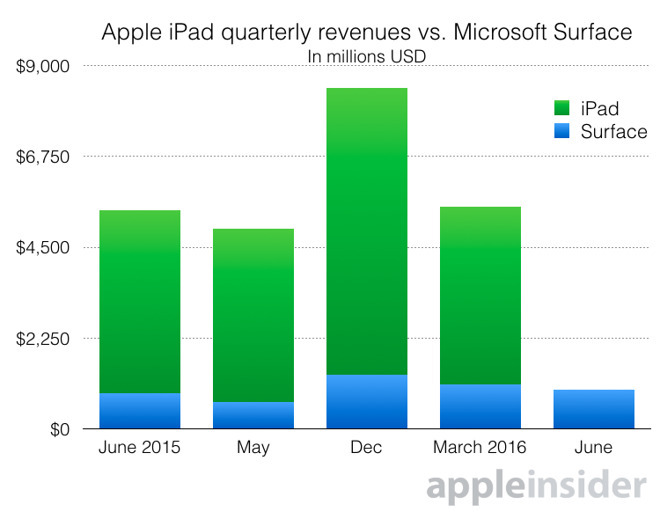 In particular, Apple's sales of iPad Pro have trounced Microsoft's Surface sales over the past two quarters. Apple's tablets offer similar performance at a much lower cost compared to Microsoft's Surface. 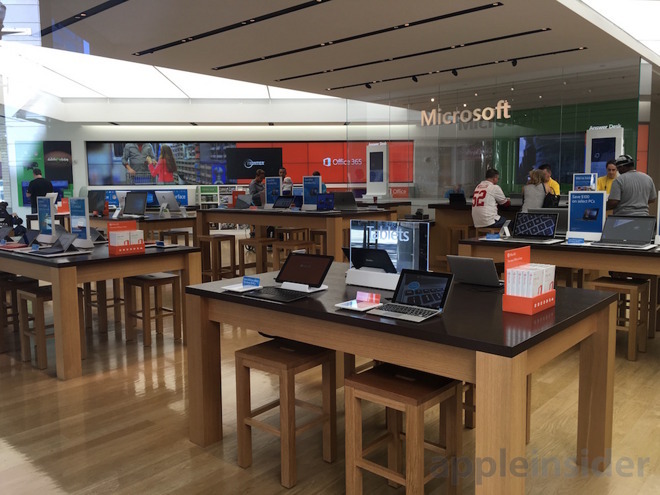 While Apple has maintained streams of buyers in its own retail stores, Microsoft has had a hard time replicating a similar level of interest in its own Surface and Windows Phone products despite copying Apple's retail strategy near verbatim. Microsoft Stores are frequently empty unless the company is throwing a special event or giving products away. In gaming, Xbox Live added 33 percent more monthly active users, but its sales declined by by $152 million or 9 percent. Microsoft's Intelligent Cloud segment which includes Windows Server and Azure, reported revenues of $6.7 billion, a 7 percent increase over the year ago quarter, but operating income of $2.19 billion, a 17 percent decline annually and flat sequentially. While very different in character from Apple's own iCloud and other Services businesses, Microsoft's cloud segment is often singled out as a bright spot in Microsoft's beleaguered earning announcements. That's likely one reason why Apple has recently focused attention on its own Services segment, which grew last quarter by 20 percent to become a $6 billion quarterly revenue source with a greater annual run rate than Microsoft's. Rather than offering commodity cloud computing services to businesses in a crowded market with collapsing profitability, Apple's iCloud earnings come largely from sales of apps, music, storage and related services marketed to a loyal customer base with limited competition for attention. Microsoft's Productivity and Business Processes segment, which sells Office, reported 5 percent annual revenue growth to reach $6.97 billion, but operating income was down 5 percent, reaching $3 billion. Subscriber growth in Office 365 plateaued at 23.1 million users, an addition of just 900,000 new subscribers in the quarter. Microsoft's transition from selling Office licensing to the current Office 365 subscription model over the last decade has resulted in the company's productivity cash cow transitioning from $10.84 billion in annual profits back in 2007 to $12.46 billion this year, an increase of just $1.6 billion across ten years. One problem Microsoft currently shares with Apple is the strong U.S. dollar, which effectively reduces the global revenues and profits of both companies. Microsoft presented its earnings in constant currency "to provide a non-GAAP framework for assessing how our underlying businesses performed excluding the effect of foreign currency rate fluctuations." Removing the effect of currency headwinds, the company says it would have achieved $22.6 billion in revenues and $6.2 billion in operating income, or $5.5 billion in net income during the quarter. Surface revenue growth would have remained at 9 percent even stated in constant currency, and the company's phone-related revenue decline would have been 70 percent rather than 71 percent.